This film is a useful and serious extended prank. 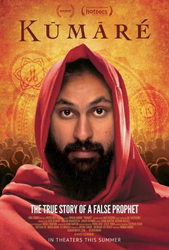 An Indian-American kid from New Jersey returned from a guru quest in India convinced gurus were only ordinary people with the job title of “guru.” The documentary begins when he decides to become a fake guru to prove that people only project guru-ness onto ordinary people like himself. He takes the name Kumare, adds a fantasy backstory, plus a made-up religion with made-up rituals and invented yoga moves. Over the span of four months he gathers a room-full of true believers in Arizona (filming the whole time), and teaches them that they “have a guru inside them” and that he is just an illusion. Much to his surprise he finds himself deeply bonding with his students who claim he is really helping them. He’s a pretty good guru! This makes his final “unveiling” or confession to them all the more painful, riveting, and uncomfortable even for viewers. Unlike the prank movie Borat, this one has a point, and it is a complex, unexpected, and subtle point. Are the people who follow him really fools, is Kumare’s deceit really noble, and will the now enlightened disciples be furious or forgiving? The true parable is spellbinding, funny, moving, and profound. A must-see.